Andrew Goodman did not like my post Eliminate Advertising. He says “in an attention economy, can you logically even conceive of no advertising? Not even remotely.” He doesn’t say why not. But, to be fair, I also don’t believe there will be a time when there is no advertising. In fact, I fear quite the opposite. I fear there will be plenty of advertising, and none of it useful. An investor in my last company–who, whatever else you might say about him, was quite smart–told me once that the company would be successful in direct proportion to the value it created for the consumer. We thought about this a lot as we built the business, and that was no easy thing, because we were in the lead gen space. And this is the problem: our incentives were not to create more value for the consumer. The consumer wasn’t our customer, the advertiser was. This is the problem for all advertisers. I think advertising is bad. I also think it’s good. I guess, in the end, I think it’s the worst possible system, aside from all the rest. Pre-internet, how else could companies let customers know what products were available to them in a reasonably efficient way? Producing a message and distributing it was a scale effort; it was only effective en masse. So the cost of delivering the message had to be borne by the advertiser. This, though, meant that the consumer had to determine if a given ad could be taken at face value. The elaborate game played between legitimate advertisers, trying to signal quality, and the others, who aped the legitimate advertisers’ messages in order to ride on their coat-tails, led ads further and further from actual information-delivering devices*. This Summer I read The Economics of Attention by Richard Lanham. Lanham argues that in an attention economy what matters is rhetoric: style wins out over substance. He argues it quite convincingly. He spooked me, saying that there is no way to have an open attention economy without rhetoric gaining the upper hand. In this world the best way to decide which product to buy is to listen to two competing producers argue with each other. Like opposing lawyers in court presenting their case to you, the jury. Or like two politicians putting up TV commercials during election season. Neither of these is an efficient way to come to a rational decision, of course, but what way would be better? Lanham views this result as not only inevitable, but the natural order of things. The scientific mindset, that there is some underlying truth, is to him an anti-Hayekian attempt at top-down control, perpetrated throughout our Western culture, from Plato through Feynman. Against this he says: there is no truth, there is only opinion; let each have their say and you decide who you think is more persuasive. Call me scientific, but I think that some products are objectively better fits with certain people than others. But I am also a Hayekian, and I don’t believe that it’s right to tell people what products are right for them. I do believe that we can build tools to help people find products better. Goodman and I can agree on this. Too many people take advertising as it is for granted, though, rather than seeing today’s environment as a bit of a historical anomaly. 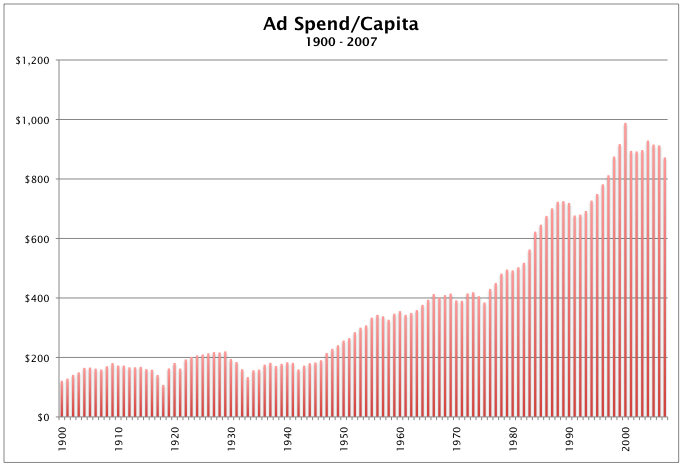 Look at the chart of ad spend per capita above** (this is in real dollars, btw.) The hockey-stick here, starting in the 1950’s, was driven by the emergence of mass media; the increase in access to consumers***. Now we are witnessing, at the same time, both the apotheosis and the destruction of mass media. The apotheosis–reaching every consumer whenever the advertiser wants–has been realized more fully than ever before. And the destruction: the consumer no longer needs to rely on getting their product information from three TV channels, a monthly and two weekly magazines, and a daily newspaper–they can get all the information they want at their own instigation. Both courtesy of the internet and its concomitant radical reduction in the cost of communicating at personal scale. Apotheosis: the sophistic element of advertising will expand enormously; I think it already has started to. Destruction: the consumer will get the facts on products in places other than ads; I think they already have started to. As a result, the slow shift of advertising away from think towards feel will become complete. Within a generation, I predict that any ad that tells the truth will be conveying an emotion and that any ad citing a fact will be a con. If this is so, then what good will it do us as an industry to target better, to buy more efficiently, to have better-converting landing pages? Yes, we need those things and can sell those things short and even medium-term. But, as an investor and some-day-again-entrepreneur, I also want to think longer-term and bigger. Longer-term, companies and consumers will still find each other through a chaotic sea of information, but it won’t be what we think of today as advertising. It will be through allowing consumers other ways of determining the truth, and using other, more grass-roots, means to convey context. I hoped someone smarter than me would read the blog post and say “I know how to do that” and then go do it. That’s why I wrote it. I still hope that. There is work to be done and better ways of doing what advertising does poorly now. Goodman calls me a utopian. I’ll accept that. * This, if you think about it, explains a lot about the advertising agency business, including why good creative is so difficult to make. (1) Real and nominal GDP, GDP deflator, and population: Louis D. Johnston and Samuel H. Williamson, “What Was the U.S. GDP Then?” MeasuringWorth, 2008. (2) Ad spend, Douglas Galbi based on Coen numbers. *** This is not to say that consumers got no benefit, just that the increased benefit was not the driver. In other words, I believe that the rise in spending per capita was accompanied by a decrease in advertising efficiency above and beyond diseconomies to scale. I’ll have to read Lanham but rhetoric in its original Aristotelian sense is both efficient and rational. It has also always been a successful underpinning of persuasion. I think we agree that the future rests in turning those pins into bits and building platforms that benefit consumers, not advertisers. No doubt, we are largely on the same page. I’ve been indebted to Seth Godin’s ruminations on everything related to this, primarily his thoughts on the “tv-industrial complex” and the “free prize being inside”. Consumer word of mouth (online) is a big (new) part of this universe. That said, over 80 (or 90) per cent of buzz is actually offline (Emmanuel Rosen). So in a media-savvy world, people’s susceptibility to rhetoric varies wildly, which is why the nature of advertising will have to change radically. If you check out my book, you’ll even catch a glimpse of a bit of Marcuse in there, adjusted for our industry. No one else has even noticed it. Certainly not the Marcusians who paid me $5,800 a year to think about those matters back in graduate school. Perhaps the primary difference between the three of us is that I think I got beyond the point of being merely intrigued by Aristotle (or Marcuse, for that matter). To the point of having had my fill. Got it out of my system. So… less intrigued by radical rhetoric and radical-sounding pronouncements. I spent the last 3-4 years (part time, while reading Business 2.0) of my doctoral studies recoiling from utopian solutions, and gravitating towards the second-best realities of moderation. I see your point, even agree with a lot of it, but also see little value in wild-eyed borrowings from the ancients, as if somehow we can adapt those concepts to modern media. Heck, I also enjoyed Postman’s Amusing Ourselves to Death. But as much fun as that is for Sunday Times and coffee style introspection, we also need to give people credit, and avoid being preachy. If it remains legal, interrupting people may not be efficient, but some companies will always keep doing it. That’s just the way it is. I think it’s heartening that we have anti-spam and anti-telemarketing laws (against surplus interruption); but worrisome that we may start preaching about what constitutes the right way to contact people to ask them for your business (surely there is some happy zone called reasonable targeting). What we have is a hot debate on our hands. I don’t know who should get the most credit for igniting it, but to me, Seth Godin is way up there. And the real world emergence of platforms like Craigslist is sort of like proof that things are changing. Andrew, I’ve never advocated the regulation of advertising, much less the forced elimination of it. I do think, though, that a better solution, one that can give the consumer all the value of advertising without all the negatives will eliminate advertising of itself, by making it uninteresting to most advertisers. Sure there will always be people interrupting us with their rhetoric to sell us products. But these people would be like the people on soapboxes at Speaker’s Corner: an annoying and not very effective way of getting a message out. But, like Speaker’s Corner, I think it’s important we let them try; we’re an open society. I think we need to focus on making the consumer experience better, rather than on making advertising easier for the advertiser. (If the latter happens as a result, that’s great.) I’m not saying this as a moralist, I’m saying it as an investor. I believe the most successful companies will be those that make peoples’ lives better. Like Craigslist, as you note, or Google. I’m a big fan of newer companies in this vein, also, like Hunch and what Jonathan is building. I think peoples’ lives would be better if they could get the good part of advertising without the bad. I think, along with Plato, that our current “broadcast” model of advertising can’t be adapted to meet that goal. That’s why I’m looking for ideas that can.